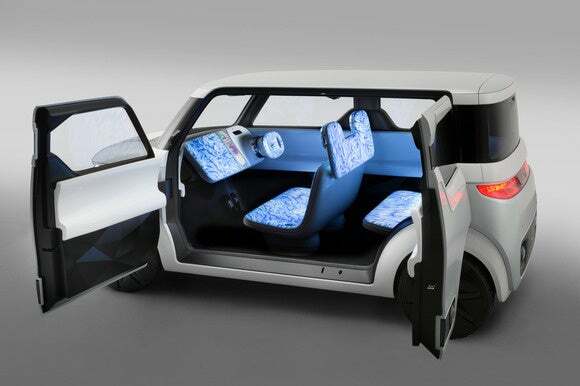 The car, due to be unveiled at this month's Tokyo Motor Show, has the snappy name "Teatro for Dayz" and the display concept spreads throughout the entire car to include the seats and even displays on the outside of the vehicle. Nissan says it's designed for "digital natives," who are accustomed to using digital devices to share content so why should the car be any different? 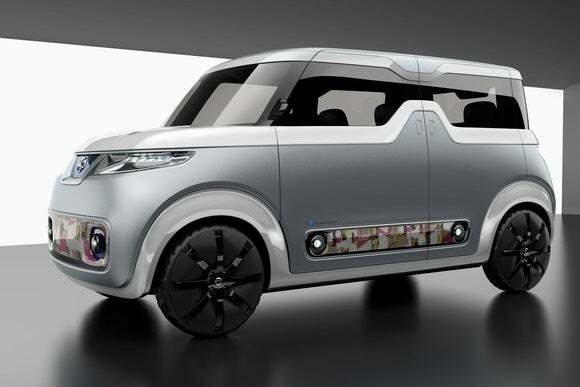 Nissan's Teatro for Dayz concept car. The car is the result of "extensive" surveys with the younger generation that came to the conclusion that, according to Nissan, young people "feel that time spent in a car should be time for connecting and sharing experiences with friends." And so the car includes a camera, so drivers can instantly share what's going on in and around the vehicle with their friends. As a concept car, the Teatro for Dayz is meant to attract attention and get people thinking differently about what a car could be like in the future. It's not meant to be a fully thought out design that's ready for the market, which is probably just as well as the solid white seats wouldn't make for a very comfortable drive. Presumably, the younger generation haven't given up comfort for digital cleverness. 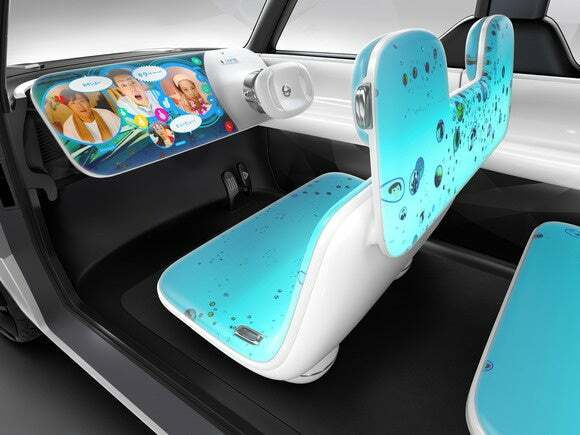 So look at the image above and you'll see the seats, headrests, and instrument panel are digital screens on which the driver and passenger can project anything. Nissan calls it a "clean canvas." The display function only works when the car is parked. In drive mode, all the driver can see are the various meters and controls necessary to drive the car and any maps that might be needed. All can be resized at will. But what the car is really all about is grabbing the attention of young people, so they turn into car buyers and don't just rely on services like ZipCar or Uber. "We can no longer attract their attention with the same old values," Nissan said in a statement while acknowledging "what moves kids today is not what moved their parents." 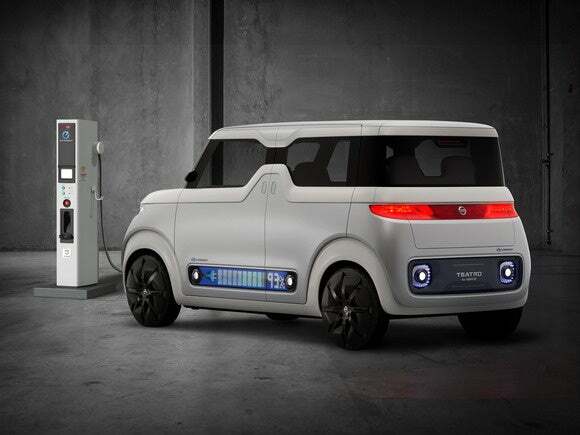 The Teatro for Dayz is an electric car, seen above in recharging mode. Notice how the door trim provides an update on the charging progress? 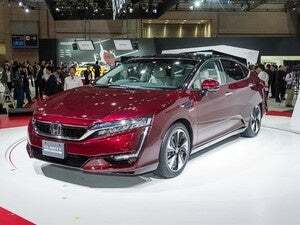 The car will be on show at the Tokyo Motor Show, which begins on Oct. 30. Nissan isn't the first car company to think about lots of displays in a concept. 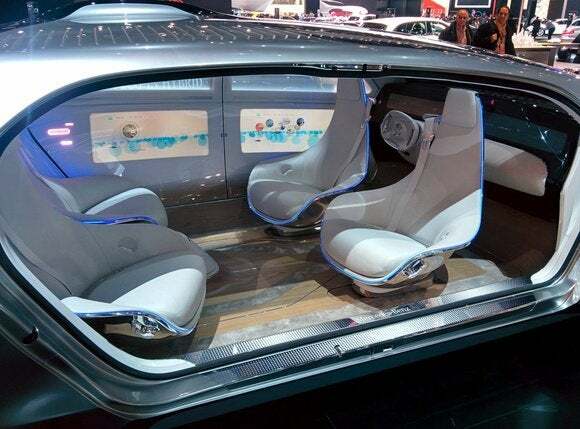 At the beginning of the year, Mercedes Benz showed off its F015 concept, which envelopes passengers with displays. The seats look slightly more comfortable and the F015 is also ready for self-driving with driver and passenger seats that turn around. The interior of the Mercedes Benz F015 concept car has seats that face each other because the car will do all the driving, seen here at the North American International Auto Show in Detroit on January 13, 2015.